Just celebrated my birthday last week, and the million-dollar question is this: How old/young are you??? :) I guess I have reached the age when I would think twice before saying it out loud. HA! So, do I feel old? Hmm… Not really, although the age 27 (there, brave ol me, I’ve said it out loud :P) also surprises me. Somehow being 26 feels a whole lot younger, like you’re a yuppie -- not-so-new in whatever industry you’re in – but still fresh, on the verge of becoming someone. It’s that intersection of still figuring out life in general and finally getting there. But 27 feels like I should be on the other side of an office desk, with a leather-bound planner in front of me, with days numbered with dates and appointments… Set for life. It feels like the serious part of life is upon me and it’s major growing-up time. Gaaah, at least that’s what the number feels like on my tongue. Yet, I don’t feel that much different. 27 is just like 26... + 1 year. How smart is that, right? :P But yes, I feel like so much should have happened in between... and yet as much as not many life-changing events occurred, I’m just glad that I’m alive and healthy, and so are my closest family and friends. So how did I celebrate it? 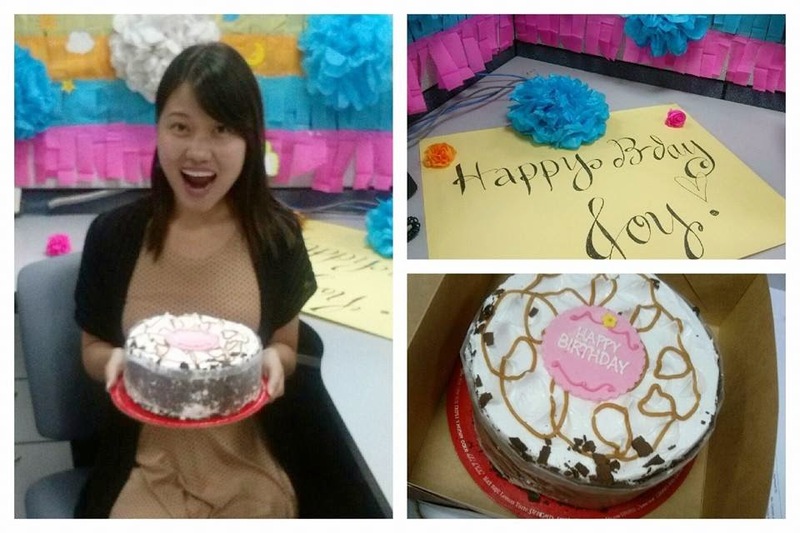 The agents surprised me with a birthday cake in the morning, lunch out with office friends at Yellow Cab (they pimped my workstation with birthday decors!!! wheeee!) and karaoke night just to belt our hearts out after shift! Perfect for a Friday night plan. We were kidding ourselves old because we had the KTV place reserved from 6:30pm-8:30pm. Who starts a Friday night that at 6:30pm??! hahaha! But hey, we managed to extend for another hour, so we left at almost 10PM! We're SO not old, thankyou. It was a simple day, but peppered with mini surprises. So thank You Lord, for your grace and love on that special day!